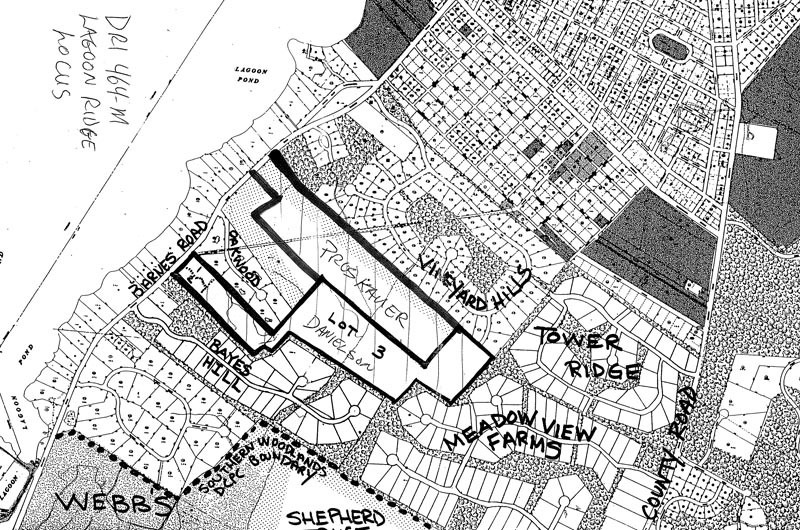 Subdivision off Barnes Road would cluster 25 houses on 32 acres. A complicated housing proposal in Oak Bluffs, now five years in the making, received a preliminary nod from the Martha’s Vineyard Commission last week. On Thursday night, the commission voted to approve a preliminary plan for the Lagoon Ridge subdivision, which aims to build 25 housing units on 32.5 acres off of Barnes Road. Preliminary, or Form B, plans are not binding and are known as “talking” plans before land use boards, including the commission. The project is the first to use a 2003 zoning bylaw in Oak Bluffs that allows greater leeway in terms of lot size, density and other factors, for projects that meet town guidelines for affordable and elderly housing, and open space. Under the draft proposal, two or three affordable housing units would be included at a later time. The joint venture between Oraibi Voumard and Davio Danielson, whose families own neighboring properties near Lagoon Pond, began in 2009. Later the partnership dissolved; the current plan is about half as big and includes only Mr. Davio’s property. The plan calls for building two market-rate housing clusters with large or standard-sized lots that would help fund the development of a third cluster with 15 smaller lots and up to 17 units. Six to eight of those units would be limited to people over 55. Land for two affordable units would be donated to Habitat for Humanity. A major issue with the plan is nitrogen loading in the Lagoon Pond, and the commission’s preliminary approval included 25 conditions, several related to mitigating nitrogen runoff. MVC chairman Fred Hancock said nitrogen is the most detrimental aspect of the project. At a public hearing in July, commercial fisherman and Oak Bluffs shellfish committee member Bill Alwardt argued passionately before the MVC that the Lagoon could not handle any more nitrogen from nearby developments. Mr. Alwardt said any new development should include sewers. Nitrogen leaching from septic tanks has led to an abundance of algae in the pond, which has depleted oxygen and inhibited aquatic life, especially shellfish. The project would need to meet all the MVC requirements, including a site-specific limit on nitrogen loading (110.4 kilograms per acre per year), and would need to meet all town and state wastewater regulations. Mr. Davio said the plan now calls for building a package treatment plant onsite to handle the waste from two of the three housing clusters, removing 90 per cent of the nitrogen. Some 60 per cent of the property would be preserved as native habitat, with trails and a 20-foot-wide easement that would be given to Oak Bluffs to build a bike path along Barnes Road. The vote on the preliminary plan was 11 to 1. Madeline Fisher of Edgartown cast the dissenting vote. In other business Thursday, the commission approved modifications to a mixed-use development on Upper Main street in Edgartown that it previously approved in 2010. Developer Colin Young said he would like the second floor of the proposed building to have market-rate apartments instead of offices. “Everyone who has contacted us has been looking for residential,” he said. “It just seems to be better off being part of the solution than part of the problem.” Mr. Young lives in an apartment on the third floor. The new apartments would not be limited to year-round tenants. The commission also opened a public hearing for a mixed-use development at Mariner’s Landing, near Post Office Square in Edgartown. Developers James Brennan and Paul Pertile hope to build a 24,000-square-foot building with four commercial condominiums, eight two-bedroom apartments and four storage units. Joyce Swartz, an abutter, was concerned about the effects of noise and lighting. The developers agreed to put up some temporary posts to indicate the footprint and height of the proposed building, and to create a rough plan that shows the proposed building in relation to the Swartz property. The public hearing was opened despite the commission’s fears that an inaccurate address on the public notice would amount to an open meeting law violation. The notice misidentified the lot as 3 Mariner’s Landing, which happens to be the law office of MVC commissioner Doug Sederholm and his associate Howard Miller. Mr. Brennan said the mistake was due to the proposal being for “lot three” on Mariner’s Landing. He urged the commission to move forward despite the mistake. The commission was unable to reach its legal counsel by telephone during Thursday’s meeting. Commissioner Linda Sibley said that depending on the opinion from counsel, the hearing may need to take place again, on Oct. 16. In response to Ms. Swartz’s concern that she would be unable to attend that meeting, Ms. Sibley said her testimony would still stand. Why is nitrogen loading a concern on the Lagoon. The MV Museum removed hundreds of trees, shrubs, and put in acres of lawn. Isn't this the way we want the Lagoon to look? Maybe they should have thought about preserving the vital natural resources of the Island before their ego got carried away with the chain saw. Historical Preservation is all about "remember when". These folks at the Museum just don't get it. Please refresh my memory, did not the MVC say NO to a very nice golf course because the watering of the grass would raise the nitrogen levels in Lagoon Pond? Now the property which was purchased for public use was to be open for that use is now fenced off on Barnes Road, not allowing anyone to even walk on the precious ancient pathways. You would have had a LESS densely populated area with selected homes and a beautiful gold course. Please MVC explain how a high density housing project is LESS of a danger than grass. Oh yes Corey Kupersmith was going to pay to hook up all the homes to the town sewer system and pay to others to hook up. The plan called for an 18-hole luxury golf course, but this one would be farther away from Lagoon Pond and would include 14 luxury homes, 16 affordable housing units and a state-owned, 12-acre camp ground. Just over 32 acres would be set aside as public conservation land. 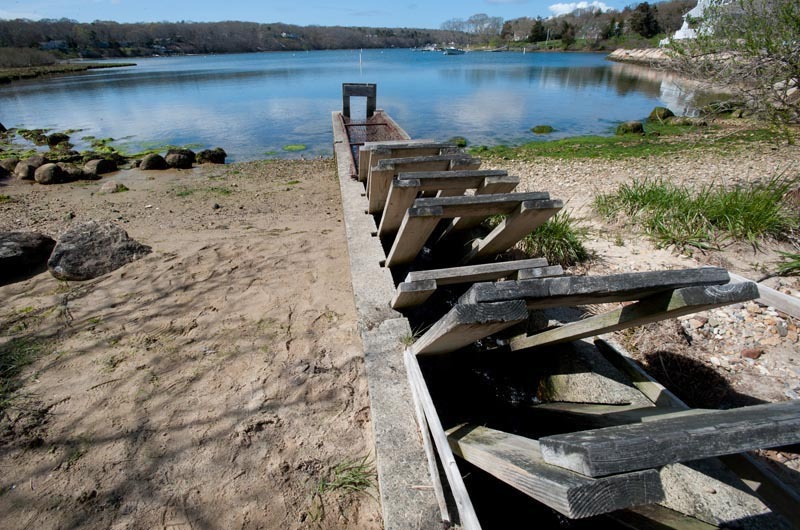 Saying it the best is Oak Bluffs shellfish committee member Bill Alwardt argued passionately before the MVC that the Lagoon could not handle any more nitrogen from nearby developments. Actually John one can walk the Land Bank trails around the old Webb's Camp ground.. A few trails are marked & in decent condition.. Problem is there is limited access to the area.. I stumbled on it by accident while visiting an elderly friend that lives in the Woodside Village complex.. Doubt many Woodside residents are even aware of it being there.. The Landbank could provide better signage for public access via Woodside not Barnes Rd.. Yes Gina, I guess if someone stumbles upon axcess you would be able to walk those ancient walk ways( which was NOT the original agreement) When the LANDBANK puts up a fence and NO TRESPASSING signs and when you do go up the road you are treated as trespasser. I would in my opinion see that they are using the land for their own benefit. The land is cleared of trees and I don't see the cut wood (LOCUST) being accessible to all. They should give the public an are to cut or pick up the wood and use it.